Hello, this is Ditka. 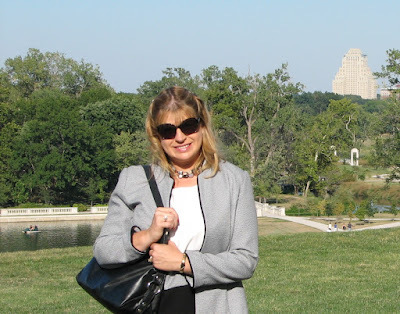 Since my sister, Sox, wrote the blog a few weeks back, it was only fair that I get the same honors of impressing you with my skills in blog authorship! As we’ve learned, it is the FrerxAdventures practice, September thru November to travel each weekend to the site of Trevor’s football game. Since the game was at Southeast Missouri State University (SEMO) this weekend, Dad found us a full hookup site at Trail of Tears State Park. 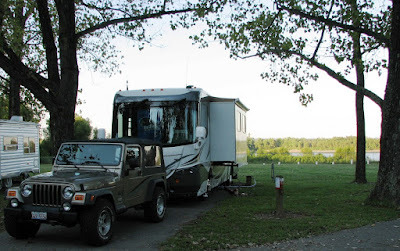 Here’s Baby and Jeep snuggled in to site #10, along the banks of the Mississippi River. This is a small campground and there weren’t many kids around to entertain us, but Sox and I were able to lay back and relax in a big grassy area behind the RV and watch all the river traffic. These barges passed quite regularly. It was particularly cool to watch two of them pass each other late at night, with lots of lights flashing out to check each other’s positions. We took our nighttime walk under a clear, starry night with the harvest moon sparkling off the water. 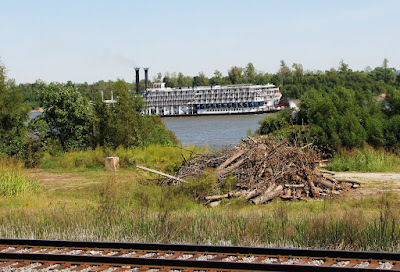 On Saturday we got a special viewing treat as the Mississippi Queen paddled by our campsite. Notice, too, the train tracks. Mom thought having trains running so near would keep us all awake but it didn’t seem to be a problem. Sox and I liked having the 7:30am train come by since it acted as an alarm clock to us and a good excuse to pounce on Mom and Dad and let them know we were ready to start the day. We took a ride with Mom and Dad in the jeep to explore the state park. 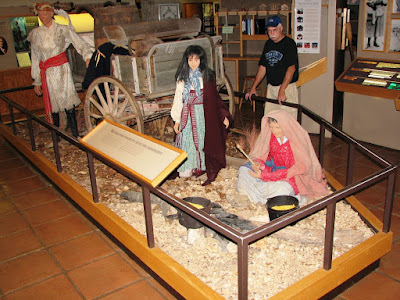 The Trail of Tears Visitor’s Center takes you back into the past to understand what it must have been like for the Indians crossing the Mississippi here on the Trail of Tears. Mom and Dad would like to come down and spend much more time at this state park exploring these exhibits, the trails, and the lake. 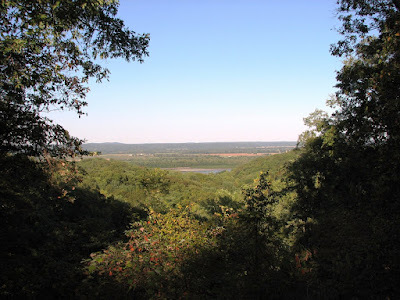 Since this was a football trip with limited sightseeing time available, we focused on the scenic overlooks. Here we were looking down river. 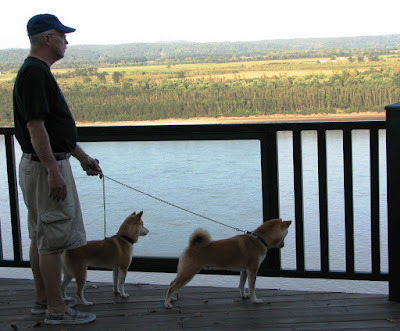 Dad kept us close since it was a long drop down from the scenic overlook. 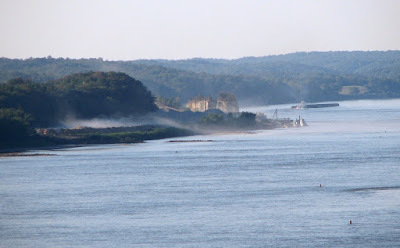 We could see mists coming off the Mississippi as we looked upriver. Sox said this was such a great place it even smelled special. Around noon, Ken’s brother David and his wife Cindy came to our campsite for a visit. We all had a really nice afternoon, enjoying a warm breeze and lots of good conversation. We all took a walk around the neighborhood and then grilled some of David’s deer brats and hot dogs as a late-afternoon lunch before getting ready for the 6pm football game. The football game was closer in the first half than I think was expected but by the fourth quarter we had a comfortable lead. Trevor had several tackles, including 2 tackles for loss. David, Cindy, Mom and Dad all got to spend a little time with Trevor after the game before they headed back to St. Louis and Mom and Dad came back to the campsite to us. It’s really not fair that we aren’t allowed in the games, since that means on away games we have to go the whole weekend without seeing our boy, Trevor. Sox and I just took a long nap in the RV waiting for Mom and Dad to come back home and turn on the TV so that we could watch the sports news highlights. On Sunday morning, we pounced on Mom and Dad at the sound of the 7:30 am train and were rewarded with an extra long walk. In fact, after Mom went in, Dad walked around the neighborhood one more time and we spent better part of an hour just visiting with neighbors. It was good because since Mom was taking a shower when we came back, Dad spyed some water coming down where it shouldn’t be under the RV. SuperKenny was soon to the rescue with the panel off under the shower. He located the fitting that seems to be the cause of the problem….just when Dad thought he was winding down on handyman work, here’s a new project for the week. 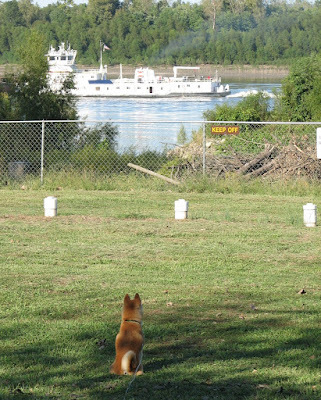 Sox and I lounged in our comfy grassy area, watching the trains, boats and barges, while Mom and Dad took there time packing up for the ride home. I thought you might want to see the Puppy tents where Sox and I travel. That’s mine on the left. Dad feels everybody is much safer if we made the trips in here, instead of possibly flying around inside the RV if he has to hit the breaks or make a sharp turn. It’s actually quite luxurious travel with our sheepskin rugs and special treats to entice us inside each time we start a leg of the trip. Well, my seasonal allergies are acting up again, and the Benadryl Mom gave me is starting to make me feel drowsy. Dad will have to take me to see Dr. Jim again for yet another allergy shot. This is the first year I’ve needed 3 shots to get through allergy season..I envy my little sister not having to have allergy shots! Ok, I’m yawning, and that cozy sheepskin rug is calling my name. 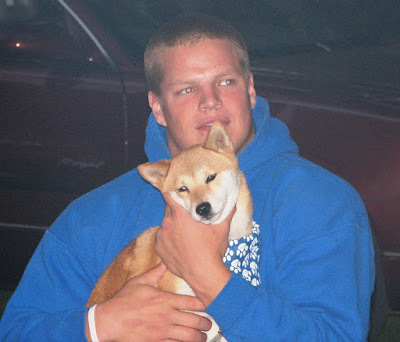 More fun coming this week…Kyle will turn 25 tomorrow and hopefully will come to next week’s home game so we can give him really big and sloppy birthday licks. Stay tuned…more fun times to come!!! Ken was busy all week preparing for our next outing. The latest addition to the RV is a cellular booster and antennae system. We seem to spend a lot of time in out-of-the-way state parks and back roads so he really wanted to have something that helped insure we had phone access to our guys and my work when needed. Hopefully it would also improve the number of places my air card for my laptop works as well. Since we have little-to-no signal in Fox Ridge State Park this would be a good weekend for testing. We were able to prove that Ken did have it hooked up appropriately as it did boost signal giving us up to 5 bars where before we weren’t getting any reliable signal. Unfortunately, you have to have the cell phone or air card almost right on top of the inside antennae before it works. The other possible problem is that the booster box seems to get really warm in the cabinet where Ken has it discretely mounted. There is a different antennae Ken may have to buy to solve the first problem. He’s going to call the manufacturer about the booster getting hot. In the meantime, we are not leaving it on for long periods, and we leave the cabinet where Ken has it installed open to disippate the heat. Once Ken has the chinks out I’ve asked him to include more info here for those interested in how this works. Ken finished the booster/antennae job by Wednesday so that on Thursday he could focus on doing another round of cooking for the boys. 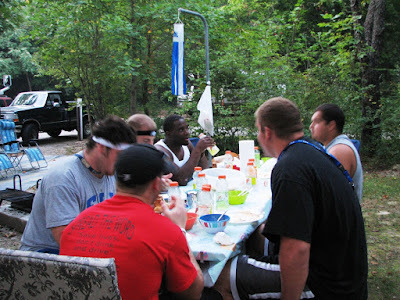 This time he made vegetable soup and sloppy joes…continuing the theme of having things the guys would get to enjoy if they were outside tailgating before the game instead of inside getting ready to play the game. I ordered a cherry and peach pie from the Amish restaurant in Sullivan. That made for a good excuse for us to stop there for lunch Friday on the drive over. Absolutely awesome buffet and a lady in Amish attire, who looked like she could have been my Grandma Genenbacher, brought our pies out of the kitchen just as we were finishing our meal. They were still warm from the oven and it was lucky we were both stuffed from the buffet because they added a great aroma inside the RV for the last hour of the trip. We had campsite #10 this time. It looked ok but ended up being a bit uneven and took some blocks under the tires to get leveled. We’ve decided that for our needs campsite #12 is by far the best will lots of room for the dogs. #11 is a close second so long as we keep the dogs out of the tree sap and #7 or #9 would probably be ok as well if our top picks are reserved. Unfortunately, now that we’ve gotten to know the park we probably won’t be back again this football season. 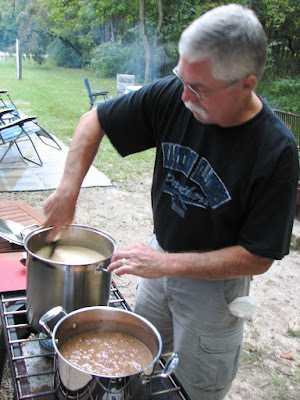 Because Ken had almost all the food prepared in advance, all we had to do was get the soup on our ‘Big Gas Grill’ burner and the sloppy joes and nacho dip warming in the crockpots. Then, we kicked back and enjoyed a late afternoon siesta before the guys arrived. I barely had time to get things uncovered before Trevor was digging in. He’d brought 6 other Panther dinner guests. Notice the orange topped bottles on the table. They went through 21 gatorades during the meal besides all the sloppy joes, 3 bags of nachos, with dip, lot of vegetable soup and 2 fruit pies. There’s not much worry about leftovers with this crew! The guys came in to the RV and watched the ISU game we had taped. I hadn’t thought about it but they don’t usually get to see the TV broadcasts so while they have to relive these games with the coaches again and again on tape, the broadcast version really gave them a different perspective. They have to keep things pretty low-key the night before the game so we they weren’t in any hurry to take off which made it nice. Once they did head out, Ken and I finished the cleanup and then took the dogs for a walk under an almost full moon, and then called it an early night. Saturday morning, Trevor dropped by for breakfast. 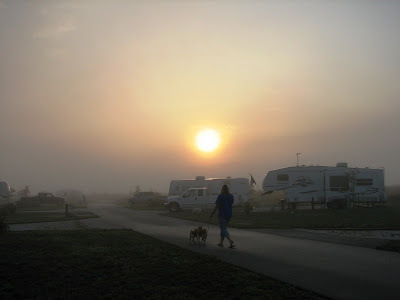 We enjoyed time with the coffee pot out on the patio and walked the campground with the dogs. As usual there are always interesting new neighbors to meet. There was a large group of Amish enjoying a weekend outing together. We also met a 65-year-old man and his wife who were adopting 4 small foster children, at least one that obviously had special needs. What an amazing commitment to make at that stage of life—how lucky those little one’s are to happen into the arms of such loving people. We took our time on our way over to Terre Haute. We stopped in Greenup, IL for lunch. 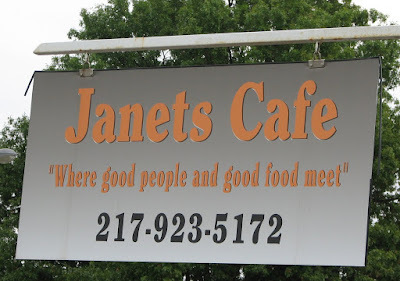 at Janet’s Café for lunch…while the building itself appears to be very old and a bit rundown, they appears to have a very good ‘working man’s lunch fare including a great homemade butter brick/heath bar cake that day. 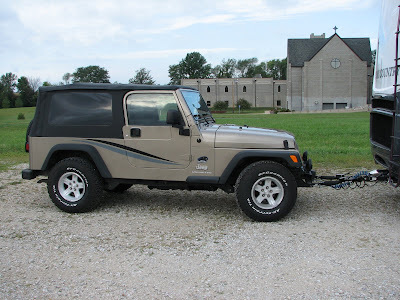 Since we had time and were in the jeep we took the two-lanes over to Indiana. It was a lovely drive through farmland and wooded areas that are just showing a twinge of gold and orange at this early start into autumn. 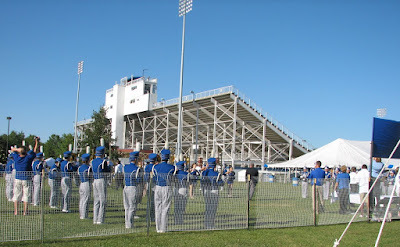 The Terre Haute Memorial Stadium where the Sycamores play football is a large stone structure that was once a baseball stadium, now converted for football. Compared to Purdue, we were able to park closeby and spent time checking out the area around the stadium. Do you recognize the name Max Carey? Well, you know more about baseball than me if you do (which doesn’t take much). 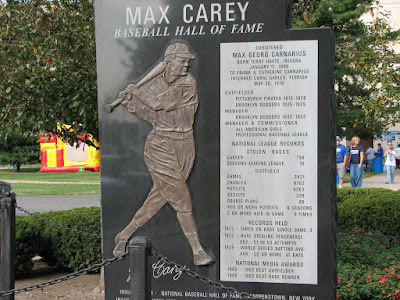 Max Carey – is Terre Haute’s contribution to baseball. Ken was amazed at a couple of his 1922 stats in particular, stole base 51 or 53 attempts that year and holds record for being on base most times in one game with 9 times. This is the kind of fun stuff we enjoy finding when we are able to take our time and explore a bit. and were able to be pretty close to the boys during warmups. 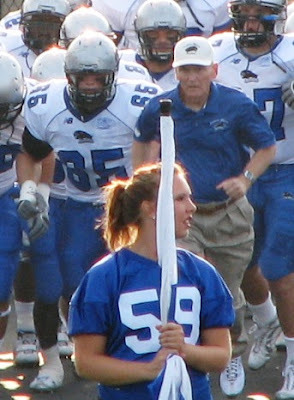 Here’s Coach Spoo, Trev and a horde of Panthers headed out toward the field and some unsuspecting flag girl ! We got a tip from Pug, that we could ditch the stands and watch the game from behind the visiting team bench. Here’s the Larson, Frericks and Nasti families enjoying the game from that very comfortable vantage point. In fact, it even gave us the chance to be close enough to hear a lot more of the sideline chatter. Here’s Coach Roc and the d-line strategizing. It was actually a pretty relaxed game. There was never much question of the outcome as we were ahead within a few minutes of kickoff and by 4th quarter were purposely not further running up the score. 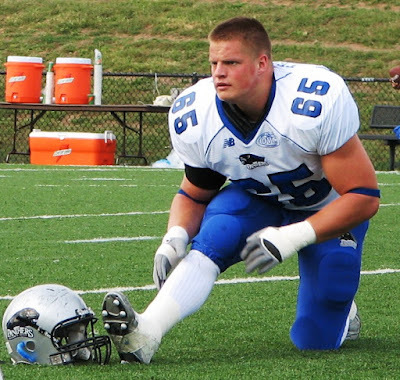 A lot of EIU players got playing time. We spent some time with Trev and the guys outside the locker room after the game and then drove the hour back to Fox Ridge State Park. Sox and Ditka were very happy to see us and take a nice long walk. With a cool breeze through the RV bedroom, all 4 of us were sacked out before 11pm. We enjoyed a quiet morning around the campground and had Trev out to for breakfast at what was much closer to lunchtime. We took our time and packed up and were on the road by about 1:30. As usual, it’s on the road home when I get the time to write this blog. We’re passing the smokestacks in Springfield right now and the Cubs are beating the Pirates right now 8-0 so Ken’s enjoying the drive home! 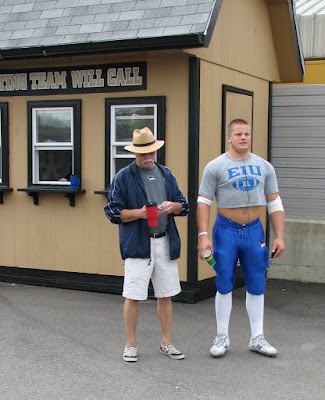 Weekends like this are the best…we don’t have to rush anything or hurry anywhere….and EIU wins!!! 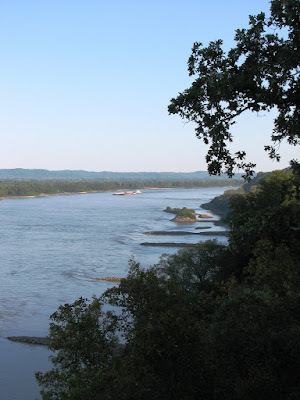 Stay tuned…next weekend is Trail of Tears State Park, and the EIU game against Southeast Missouri State in Cape Girardeau, Mo. We were on the road by about 9am on Friday morning. 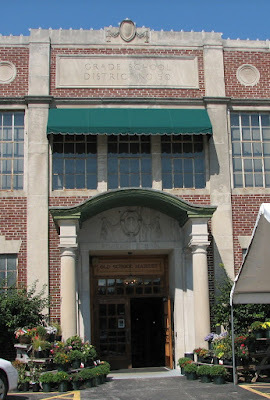 When we reached Sullivan, IL we decided to stop by the ‘Old School’ market and 'essenhaus' since it looked like a good place to consider for a stop on the way back when doing roundtrip tailgating Saturdays. 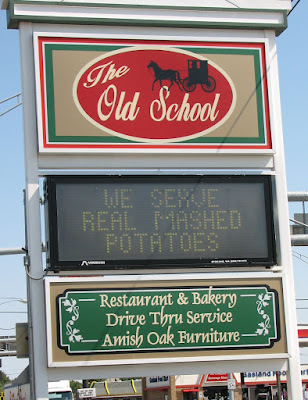 It’s an Amish restaurant with buffet-style service. The food and service were great and reasonably priced, so I made reservations for the next tailgating weekend since they said they are always full on Saturday evenings. When we reached Fox Ridge State Park, site 12 was ready and waiting. It is perfect for us with plenty of grass for the dogs, 50 amp service and plenty of room for outdoor entertaining. We took our time setting up, walked the dogs up to the camp office to pay and picked up some ice from the campground hosts. Ken got the grill going for warming his ‘Better-Than-Olive-Garden’ Sausage and Potato soup and my roast and gravy for sandwiches. I had also made up nacho and dip and cheesecake. We had everything pre-cooked just needed to heat up. Trevor and 5 of his friends came for 6pm dinner and put a good dent in the food. All 4 d-tackles from the 2-deep chart were there as well as a linebacker and an offensive guard. That crew can really eat. Ken’s brother Michael and sister-in-law Jean pulled in with their 5th wheel in time to join us. We all sat around a bit and enjoyed the fire after. Later that night Trevor came back with Sarah and sat by the fire chatting until about 10:30. It was downright chilly by the time we went in and we kicked on the heat for awhile and watched the ending of ‘Streetcar Named Desire’ on late night TV. We slept really great in the cool evening and enjoyed a lazy Saturday morning, to the point that it was almost 11am before we finished breakfast. Since we were in town we could get cell phone service again, we checked in on the boys. Kyle, along with his roommate, Aaron, along with Luke and Lindsay Henke had made it to Trevor’s house and would be meeting us at the stadium later. Michael and Ken had found an advertisement for a new RV park being built just east of Charleston by the speedway so we decided to check that place out before we headed back to Fox Ridge. Lincoln Springs Resort is a work in progress. 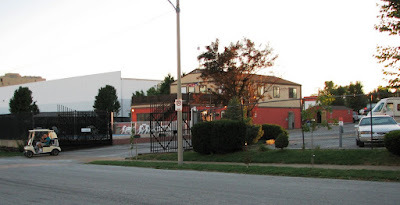 They have a very nice putt-putt course and game room and soon to open Stovepipe Grill & Restaurant. 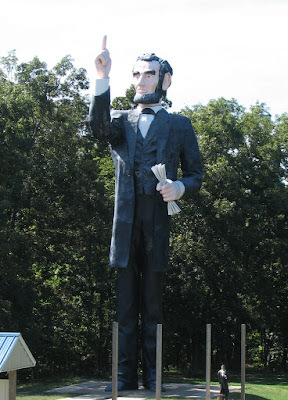 They also have the tallest statue of Abe Lincoln in the world! By next summer they should have their RV sites and cabins built around an existing lake. They plan to have a pool as well. We’ll have to try this place out for something different next season. We all went back to our campsites for leftover soup and roast beef sandwiches, Ken got the VCR set up for recording the game and then packed back up again so we could get to the stadium for tailgating by 4:30. We were surprised to find lot’s of Quincy folks dropping by our little makeshift tailgating area. We were having such a good time that we actually missed the opening kickoff which is a real first for us. Here’s Ken, Michael and Jean. 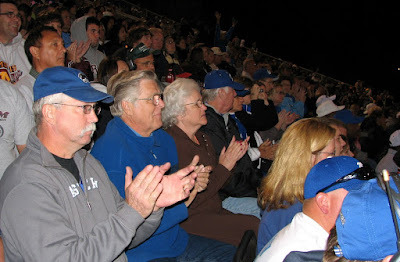 I think this level of applauding was probably for the halftime show since the game got them a little more active! It was a really good game with a really bad outcome. 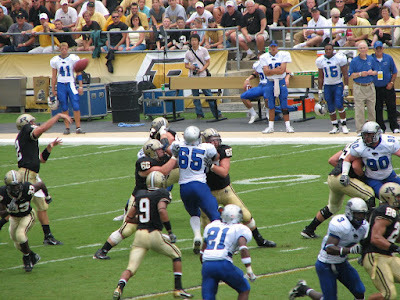 In the last minutes of the game, behind by one field goal, EIU had all the momentum, with the second-string quarterback orchestrating what appeared to be an unstoppable march toward the goal line. In the last minute they were within field goal range and had one more snap to try for the touchdown before settling for a field goal to tie and go in to overtime. Then the quarterback drop the ball on the snap and it was all over, we lost. Having two nationally ranked teams play such a close game was exciting to watch but heartbreaking to lose that way. We felt really bad for the quarterback. There was one very bright spot during the game. My niece, Sheila, called to tell me that it was in fact good that they cancelled out on joining us ath the game since her sister, my goddaughter, Deanna Venvertloh Twaddle, gave birth to a new baby girl! Girl #2 in the family of Deanna, Justin and now ‘big sister’ Lily. 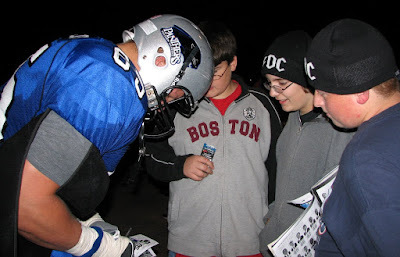 The turnout of the game didn’t deter some young fans from prodding Trevor for his autograph after the game. 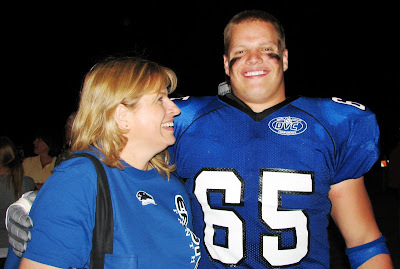 We all drove out to Trev’s house for awhile where the team had a huge post-game party planned. 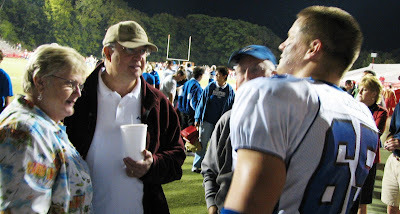 Trev, with his shoulder iced down, shared his post-game pizza with Kyle and Dad. Luke and Lindsay dropped in at the house for awhile as well but decided they’d best drive back to Lindsey’s parents in Bloomington before it got too late. As the college students started streaming in to the house, Ken, Michael, Jean and I decided we were getting to old for this kind of Satuday night, and after getting assurances from Kyle and Aaron that they would call rather than try to drive that night after drinking, we went back to our RV’s and called it a night. About 3am the phone rang and Ken drove back to the football guys house to rescue Kyle and Aaron, who slept/passed out for what was left of the night in the motorhome with us. Surprisingly at 9am Trev called Sunday morning, looking for breakfast. 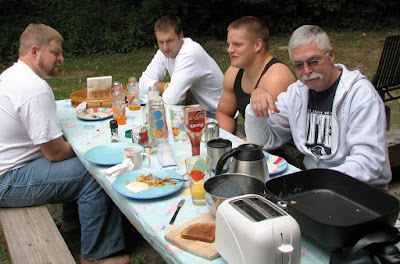 We left Aaron and Kyle sleep as long as possible by cooking breakfast outdoors. Shortly before noon we loaded up the guys with remaining leftovers and sent them on their way. We packed up and pulled out around 1:30 at that same time as Jean and Michael. 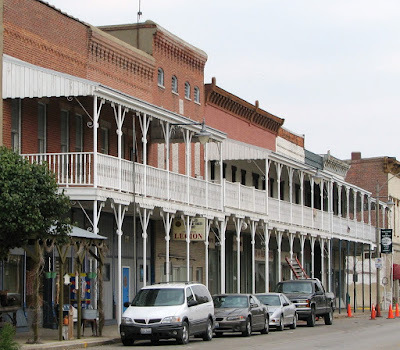 Of course, while we were headed back to Quincy and another work week, while they had decided to spend some more time in the area exploring Lake Shelbyville. On the way home, I called my sister, Kathleen, to congratulate her on her new grand-daughter and get the details. My new great-niece is named Caleigh Joelle Twaddle, and weighed in at 7lbs 14 oz. 2 year old Lily is apparently thrilled with her new baby sister and officially pronounced her a ‘cutie pie’! 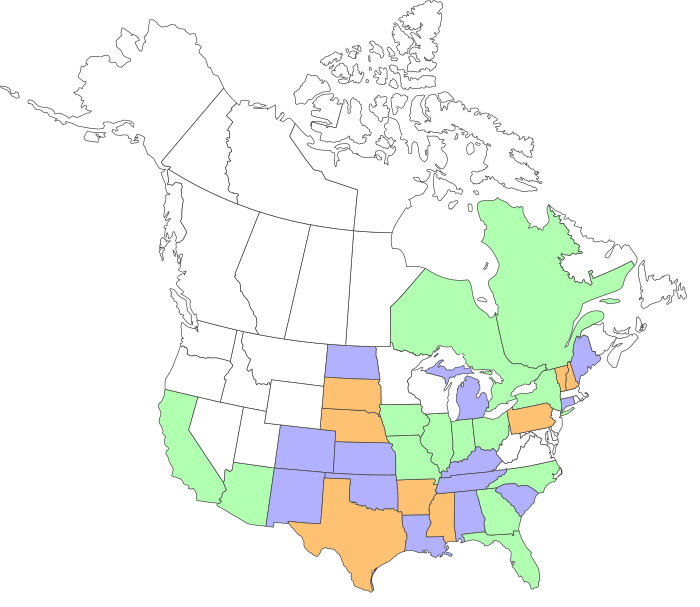 I’m finishing this blog entry off as we finish our final hour toward Quincy. It’s a bit windy again and the farmers are all out in the fields kicking up a dusty haze along the interstate. Ken has the Cubs on the radio and they're winning. With the exception of the final score of the EIU football game it has been a great weekend, getting to be with all our boys and sharing fun times with family and friends. As we cross the Eagle Valley bridges, our conversation turns to planning for the next adventure in less than 5 days. 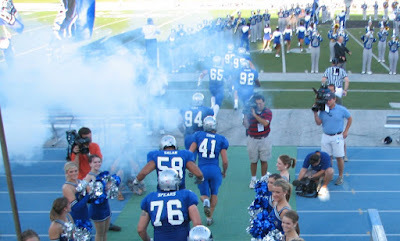 Stay tuned…next week is the last non-conference game for EIU, playing Indiana State at Terre Haute! We hooked up and pulled out about 9am on Friday morning, Sept. 7th. Since our last trip Ken had some graphics added to the side of the jeep to coordinate it with ‘Baby’. Ken was able to order them for $40 and nephew-in-law Jim did an awesome job of applying them for us. I had been asked to put a series of cost models together for work while we were on the road, so I focus on my laptop while Ken fought the winds from the incoming weather front. 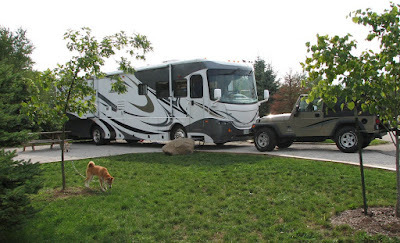 We did make a stop at Hopper RV in Jacksonville, IL. Ken had the replacement ladder delivered to that Coachmen dealership so that we could pick it up on the trip. To be able to transport it, since it is one-piece and LONG, he had to duck tape the new ladder to the old ladder until we could get back home and he could properly install. We pulled in to the Prophetstown State Park and Ken snapped these shots of the site just before it started raining. It was about this same time that I was notified from work that there’d been a change in direction and I needed an entire new set of cost models sent in by Sunday evening…the weekend wasn’t off to a great start! The good news was that Prophetstown State Park was really nice and almost brand new. 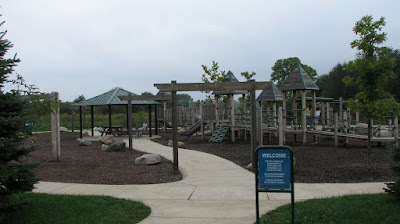 The sites were well laid out, with paving grass, a nice patio and firepit area covered with small gravel, and reasonable privacy for a new park. There were lots of pine, fir, spruce trees, beautiful natural prairie areas and miles of paved bike paths. The campgroupnd is actually a new addition to Historic Prophetstown which has a working 1920’s farm and an Indian village to visit. The bad news was that we were only there for the weekend and wouldn’t be able to take in all there was to offer. I did get a few minutes to check out the playground which was in a wooded area and so big I couldn’t get it all in one shot. We walked the dogs between the raindrops and met lot’s of neighbors who were diehard Purdue fans. The prior evening’s rains gifted us with a cool, foggy walk with the dogs on Saturday morning. One of our neighbors provided directions to a free parking area near the stadium. By the time we were in West Lafayette and parked, the foggy morning had turned into stifling humidity. We got a few minutes to wish Trev luck before the game, then met the Larson’s (Pug’s family, #59) at the ‘will call’ office. 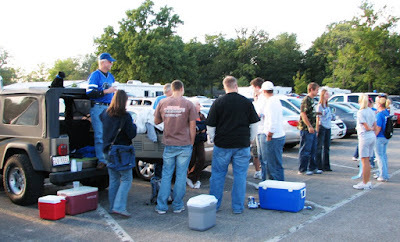 We all picked up our tickets and headed back to their car for a little tailgating. 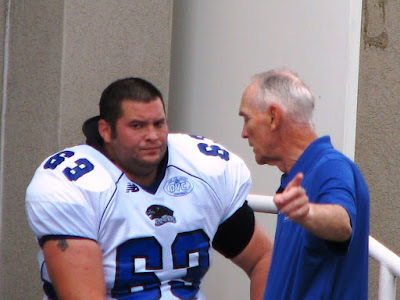 Back at the stadium, here's Drew Cairo-Gross, one of Trev's housemates, and team captain, looking pretty concerned about what Coach Spoo it telling him he's going to face on the field. The Purdue students in one section of the 53,000 fans were amusing themselves pre-game by bouncing around a giant inflatable..... oh, gross! The game itself was a fiasco. 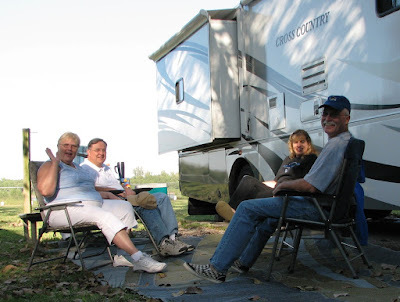 As Ken told Purdue fans at the campground later, "Yeah, we had you guys worried....right up to the first kickoff!" Hard to pass-rush with these two guys in the way! Ok, an then things got a lot worse...it started to rain and rain and rain. As the teams came back on the field after half time, but before the kickoff, there was an announcement. A severe electrical storm was headed in and all fans must evacuate the stadium and seek shelter immediately. At first I don't think fans were taking it too seriously but then the police and security staff began requiring people to move toward the exits. 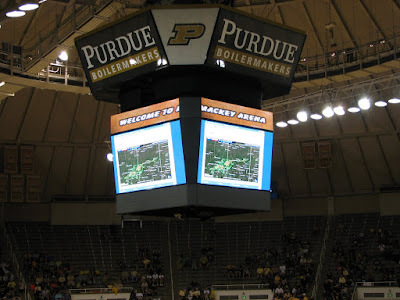 We spent the next 45-60 minutes sitting in the basketball arena watching the radar map on the jumbotron. Not many fans went back to sit in the downpour to watch the game after that. The final score was Purdue a-whole-lot and EIU not-very-many. We waited outside the locker room and met up with Trev and the guys for awhile after and then took our time walking in the rain back to the parking garage. Strange to have been sweating on the way to the game and have my teeth chattering from being wet and cold on the way back from the game! The pups were glad to see us back at the RV and Ken took them out for a walk while I got rid out of my soaked clothes and into something warmer. Ken had joked on his way out that he'd have to go take the abuse now from all the Purdue fans. We had laid out salmon for dinner but Ken was taking his own sweet time about getting back from the walk. When he did show up he had a beer in hand and told me to get my shoes on and grab some drinks...oh, and throw the salmon back in the fridge! As it turns out we were invited to spend the evening with 2 great couples from the Indy area who we'd met the day before. They were avid Purdue fans 'but cheered for 65 too'! 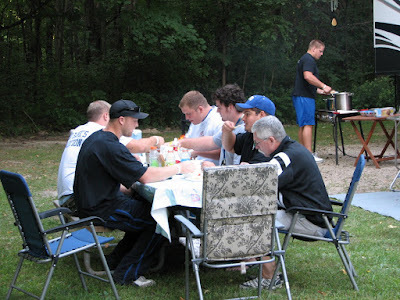 They had tailgated at the campground and watch their dish satellite on the Big Ten Channel. They shared their gameday feast with us including some bean and vegetable soup that really was perfect for the rainy, chilly evening. 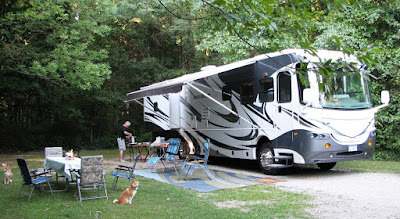 One of the couples, Randy and Eileen, have a child living down by St. Louis and stay down their in Babler State Park which just happens to be nearby our RV dealer. So, we all talked about perhaps getting to meet up again. I really hope so since they were all great fun. Isn't it strange - we've lived in our house 20 years and I can't remember every just spontaneously popping over to a neighbors backyard and setting around enjoying the evening together--like I've said repeatedly, this friendly RV neighborhood atmosphere is one of my very favorite parts of this lifestyle. About 11pm Sox started getting tired and kept crawling up on my lap trying to find a comfortable spot to snuggle in for the evening. She was making it pretty clear she was ready to go home to bed. We finally had sympathy for her and headed back in for the night. We slept in Sunday morning, then Ken fixed a big breakfast and we packed up. We spent quite a while standing around talking to folks parked nearby. I spent the drive back organizing on the new set of cost models for work Monday while Ken listened to baseball and football games. Sox and Ditka got to play with an 8 week old golden retriever at the rest stop which I'm sure was one of the highlights of their weekend! Well with the rain, the stifling humidity, the big football defeat, the rain, the stadium evacuation, half the time spent on work, the rain, the cold, and absolutely no time to explore our surrounding beautiful surroundings....no, this wasn't one of our best weekends. But even with all that, we still had plenty of fun in between the raindrops and anxiously await next weekends game between two nationally ranked teams as Eastern Illinois hosts Illinois State. Ken was showing the signs of game day on the Thursday before Labor Day. He paces more, is anxious about everything being right, and generally restless. We arrived at Charleston about 2pm and had to cut some branches out of the Sycamore tree before we could get ‘Baby’ down the driveway and settled in at Trevor’s place. The boys arrived back at the house about 2:30pm and some of the other parents started arriving as well. All of the 5 guys in the house seemed to exhibit pre-game tensions in different ways. There was generally lots of pacing, some stayed separate, ‘meditating’ with their MP3 players, others were talking, talking, talking, just getting it all out. This is such a great group of guys that Trevor lives with. They all seem to really show a lot of care and concern for each other. Two of them are team captains and that care and concern for each other is an obvious part of the team in general. They seem to be a really tight team, which we’ve learned is what its all about. 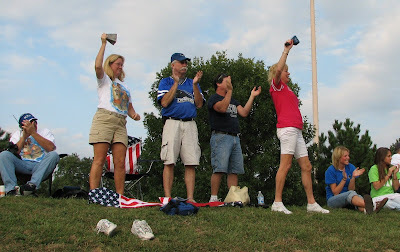 The guys left at 4pm and after shutting down and settling the dogs into the RV we headed for the game as well. We were pleasantly surprised by the atmosphere at the stadium. There was already lots of activity and tailgating was well underway. We met another couple who had a motorhome there and discussed ‘the ropes’ on arrival and setup for when we bring ‘Baby’. We also met the gentlemen in charge of the parking and he assured us he would save us a spot for the motorhome for every 1:30 game, but encouraged us to be there by 11am if we want to have room enough room to get turned around and positioned as we’d like. 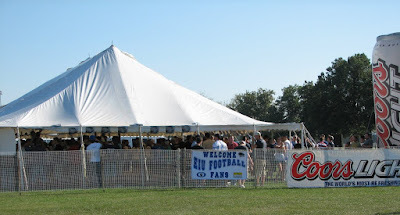 The local liquor store and primary bar sponsors actually provide a tent with free beer, brats and burgers before the home games, so that is definitely the place to be. It will also limit the amount of food we need to bring with us for tailgating! Before the game the band does some ‘pre-game’ warmups for the crowd in the middle of the tailgating section. We spent some time with some of the other parents and then found our seats. There is a lot of team spirit here and it was a real ‘Mom thrill’ to see my boy run out on the field with the team for his first game as a Panther. He’s number 65 near the top of the picture. Despite the lopsided ending score, the game had its fair share of excitement. Trev had a decent amount of playing time and was on defense for 3 turnovers including one where he got the fumble recovery. If you look close here you can see him making the fumble recovery. We met up with the guys outside after the game for awhile before they went into the showers. Although their was some general celebration after the game, the team has pledged not to drink and drive in honor of one team members, Micah Rucker’s girlfriend who was killed by a drunk driver, so the guys keep it under control. Friday morning Ken had his coffee outside while chatting with his brothers who watched the game on TV. We fed Trev breakfast and then went in to the Book Store while Trev went to a class. I found some great little Panther scarves for Ditka and Sox to wear to the games and a new coffee cup for work. I could have easily dropped several hundred dollars on Panther items if Ken wouldn’t have reigned me in! Trev likes having us cook meals he likes from home when we have the RV rather than go to restaurants so we did Salmon Croquettes for lunch. One of the other guys from the house, James Larson, aka 'Pug', joined us for lunch. Mealtimes with these guys are some of our favorite times in Charleston since we really get to know everyone better over some good home cooking! The guys went back in to town for practice after lunch and Ken and I packed up for our trip to St. Louis. We knew our timing wasn’t the greatest since besides Friday afternoon, this was the weekend of the Mizzou-Illini game in St. Louis, a big blues festival, an air show, a Japanese festival…etc., The traffic didn’t really get bad until about a mile from the Mississippi River. Since Ken knew the lanes he needed in advance it actually worked out find since the 3 or 4 miles creeping along at 20 mph were right where we had to find and make several exits so we had plenty of time for reaction. 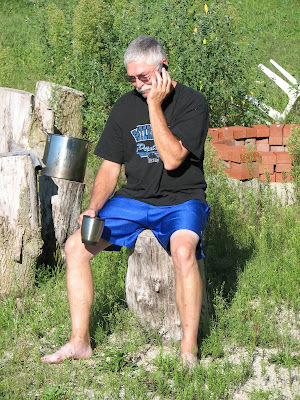 Ken had called brother Micheal, who was meeting us at the St. Louis RV Park and told them they best plan their evening without us since this 140 mile trip had been pretty tiring for him. I knew in advance that the St. Louis RV Park was not going to be one of our preferred parks. We know we prefer more rustic, private areas, but let’s face it, we were here for a wedding in downtown St. Louis so being downtown made sense. By the time we arrived, Ken’s brother Michael and sister-in-law Jean were already at the evening’s St. Louis Card’s game. While the RV park is basically a parking lot with hookups, it does have a nice pool and very nice hosts. It’s also very clean. It’s not a part of town where I’d take walks by myself but the park itself is fully fenced and feels secure. If you are coming to St. Louis to visit downtown attractions such as the arch, ballgames, museums or the zoo, this place is very conveniently located. Setup went quickly and then we did spaghetti and garlic bread for dinner, something easy and quick, so we could kick back for what was left of the evening. Ken’s brother David, father of the bride, and his wife, Cindy, came by to bring us ‘welcome bags’, like they’d left at the hotel for the other guests. That was very thoughtful of them. In fact the cookies included were so good that we were thinking of being devious and swiping them out of the bag they left for Michael and Jean! It’s good Michael and Jean got back when they did or they may have been cookie-less. Saturday was Jean’s birthday so we headed to Zia’s on the Hill for lunch. Our contribution was a bottle of Montevina Terra d’Oro Zinfandel. Definitely a wine I’ll do again. Back at the RV, poor Ditka was itching up a storm. He has allergies that flare up every August/September and, although he’d had an allergy shot a few weeks back, it was now apparent, that, like last year, he would need at least two shots to relief his itching. We decided to walk to the nearby convenience store to buy him some Benadryl as a holdover since he seemed so miserable. There were a lot of people in and out of this store, and for some reason, a couple of the guys thought we should sell them our dogs. I was glad to get back to the confines of the RV park. 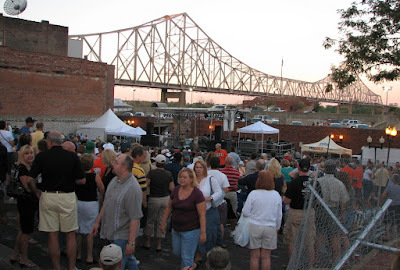 Saturday evening the four of us ventured down to the blues festival at Laclede’s Landing. Pretty bad timing on our part as we were in the area of the dome just as the Illini-Mizzou game let out. We walked through the festival and checked out a couple of the restaurants. It would have been a 2 hour wait for any table on the landing so we decided to head out away from the festival and ended up eating at Maggie O’Briens. Great ribs and a seat where we could watch the Card’s game and the Southern Cal game on different TV’s. 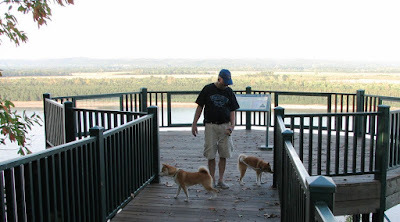 We all took the dogs for a leisurely walk when we got back to the RV Park and then called it a night. While the Benadryl did seem to be helping Ditka, he slept on the foot of our bed and had lots of bouts of itching that vibrated the whole bed. Ken woke up enough at one point to tell me to quit putting quarters into the bed!! Sunday, I took my computer down to the pool and started on this blog. . They had really comfortable lounge chairs and were in not for the wedding I could have made that my roost for the entire day. 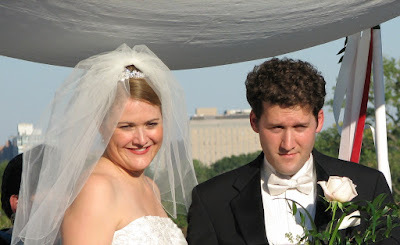 Jennifer and David had everything extremely well organized. We met at that Renaissance Hotel, which was the base of activities for the wedding, and boarded busses to the Art Museum at Forest Park. 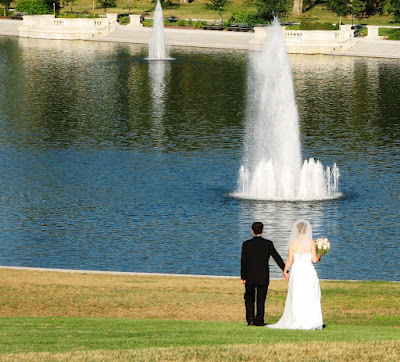 They had one bus leave early so that we could spend a few hours in advance enjoying the lovely scenery at Forest Park and browse the Art Museum before the wedding. If art museums are your thing, this could easily take your full day. 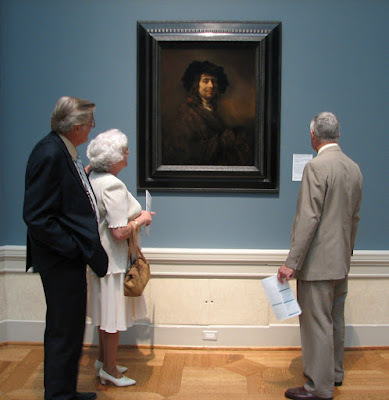 It’s been years since Ken and I had visited and now we want to go back when we can spent more time getting to know some of these famous works. I think my favorites are the Monet’s along with the number of ancient Buddhist sculptures and Mayan pottery they’ve acquired over the years. 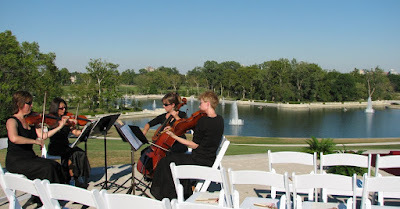 David and Cindy’s girls certainly know how to pick gorgeous sites for their weddings. This is a view from our seats at the ceremony. …and as the newly announced Mr. And Mrs. Loiter. 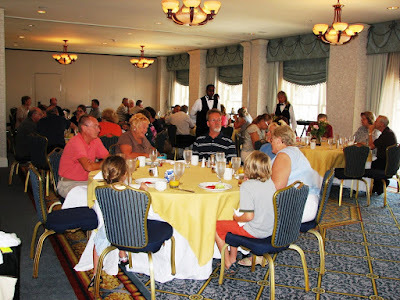 After the ceremony, we were transported back to the Renaissance Hotel for an evening of dinner and dancing. It was a wonderful evening with family and meeting several new friends from the East Coast, who were long-time friends of the Loiter family. Nine of ten of the Frericks brothers and sisters were in attendance along with spouses, so we always wonder if we can be a bit overwhelming as a clan! Unfortunately, as usual, my internal clock, clicked to ‘off’ at about 10:30 and so we decided to call it an evening and were back to the motorhome by 11:30. Having been inside since 2:00, Ditka and Sox were very happy to get in a midnight walk. Monday, we rode with Michael and Jean back down to the Renaissance Hotel for a buffet brunch hosted by Cindy and David for the out-of-town guests. We got to say our final good-byes to new friends and out-of-town relatives, like Rick Woodward, who had traveled in from Washington state. 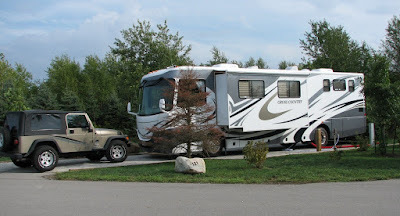 Back at the RV park at noon, we packed up and headed out…we headed back to another work week in Quincy while Michael and Jean, lucky retirees that they are, decided to drop by Pierre Marquette State Park for a day or two. So we close this weekend with one final picture of Jen and David enjoying a quiet moment alone together after their ceremony.